Provided by the publisher for review through NetGalley. 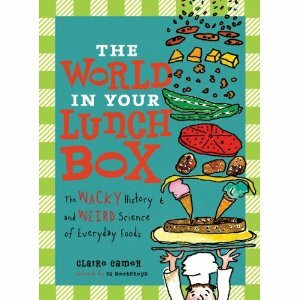 This is a fun read about the history of foods common in North American lunchboxes and supper tables. We all know about the Duke of Sandwich wanting to eat something with his hands so he didn't have to leave the gaming table. But I didn't know about the Bishop who ate his seal-skin boots! The book goes through a week of lunches and the history behind each ingredient from the spice wars over spices we get at the grocery store now to the science behind pita bread and vanilla pods that only open for a single day. My kids absolutely loved the illustration of the dog's stomach after lunch. One of the attractions for me is the multicultural aspect. Of course so many of the foods eaten in Canada and the US come from many places across the globe, and just reading about all the places sourced in one meal is a geography class in itself. The crisp-chip name discussion about the different names used in English-speaking countries was fascinating to my kids who think they are called potefurai! Of course the best thing about this book for me was the introduction to my kids of North American food. I noticed there was no mention of intricate kyara-ben (character bento box lunches which are ubiquitous in Japanese kindergartens)! This is a book that is funny as well as informative, an enjoyable non-fiction book for kids. I read this book for Nonfiction Monday, which is hosted this week by EMU's Debuts. This is the 31st book I have read for the 5th Canadian Book Challenge. Wow! You're busy reading!! This is such a cute idea. I remember loving, and still do, weird fact books, done in a fun way.